And just like that three days of racing has come to an end. It's funny how your body can hold it together but once you know it's all over, things shut down. I was lively this morning and now feel like the hands acquired arthritis, the back is that of a 97-year-olds, and the rest of the body feels like it was thrown from a moving semi and then steamrolled. There are a few beers in the fridge but I can't even think to stomach one with how that race beat me up both inside and out. I'm sure my mind will change this evening when all the racers gather and peer pressure begins. For now, I'll have some chocolate chips. Day 1 had mandatory birthday celebrations for Kabush. 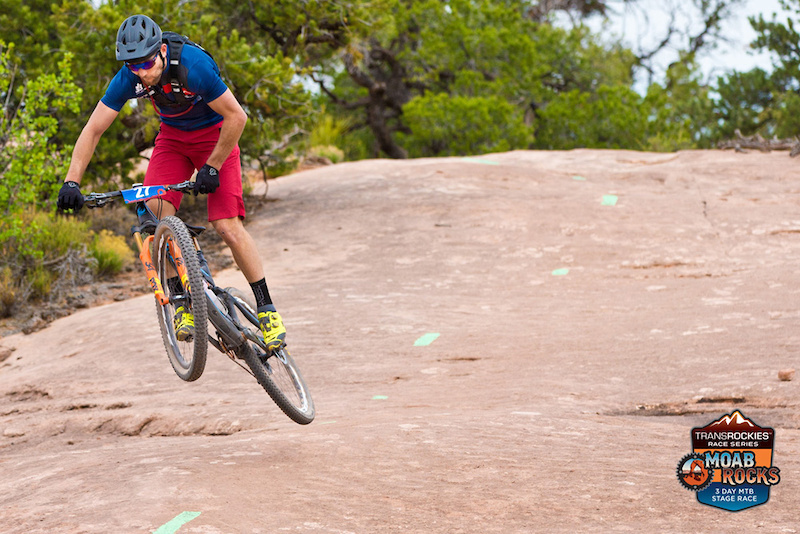 There were some brave individuals this weekend who rode hardtails with high posts and they each deserve a highfive. 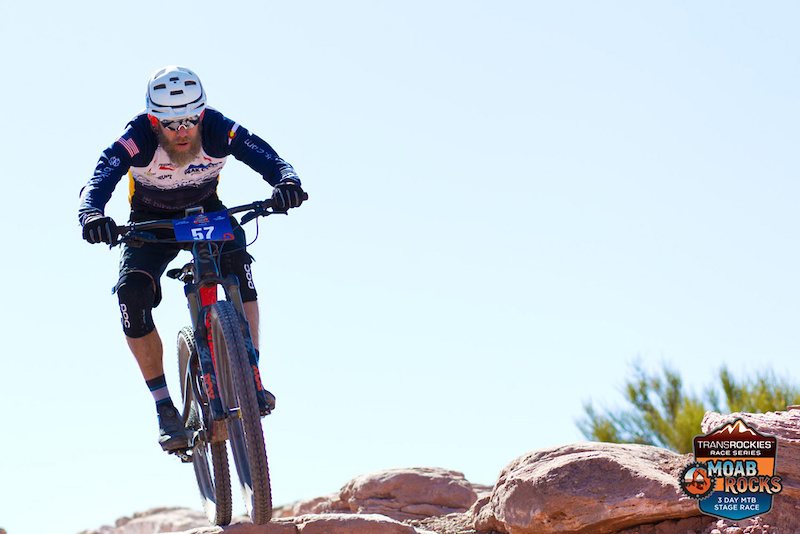 I heard a lot about Moab before I came and opted for a more trail set up on the XC bike but it was still rugged out there, and I can't imagine what a hardtail would have been like. I questioned my set up each climb and after each descent, I would smile and think about much those burly tires, larger fork, and dropper post helped. 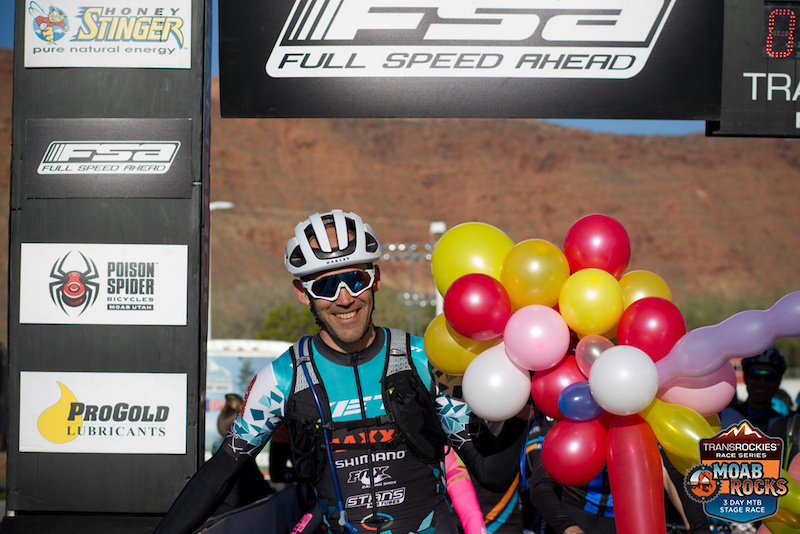 After the final stage all racers, staff, and volunteers will gather in Swanny Park to celebrate the good times, the tough times while sharing these stories over drinks, awards and a photo slideshow. 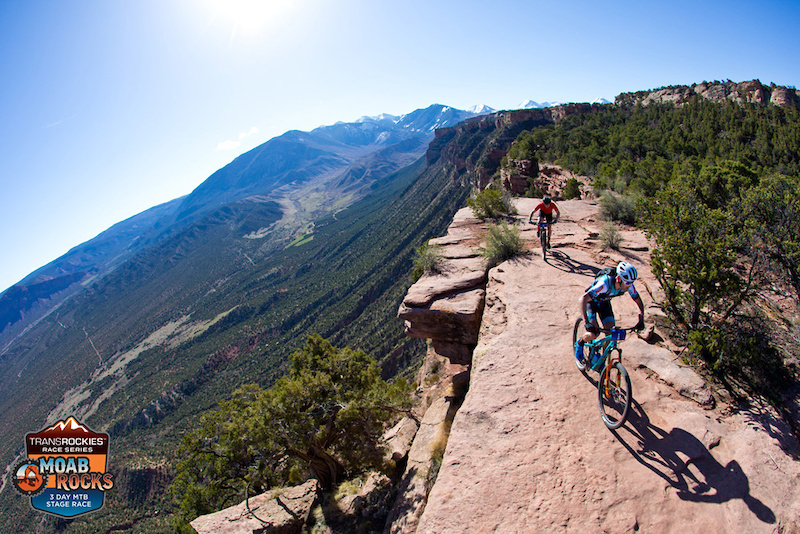 Stage 1 on Porcupine Rim was a rough but stunning day on the bike. Over those three days, there were many battles that took place at the front of the field, in the middle, and at the back. Stage finishes determined the overalls that some riders were chasing, while others were here to just finish the race. 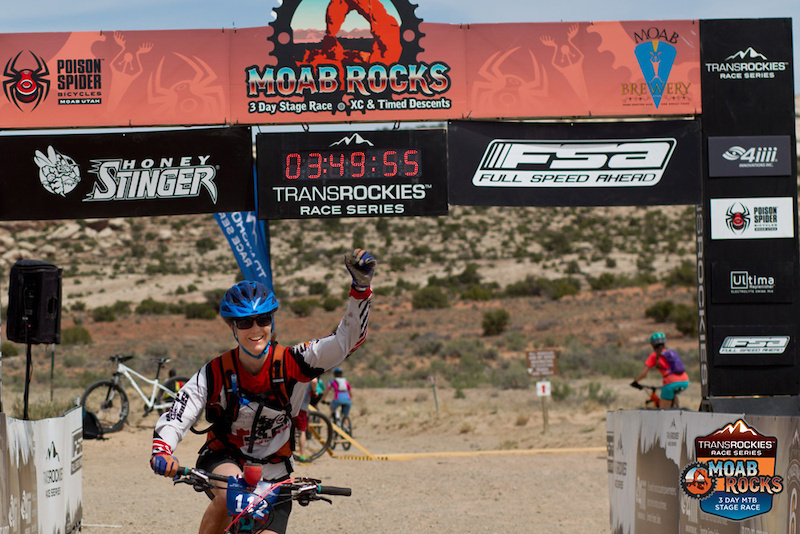 Either way, Moab Rocks was a race worth doing and one I assume many will return to (I definitely will be!). Stage racing is always unique because it attracts so many different types of riders and caters to everyone; those who want fitness gains through racing, those who are looking for an experience and challenge, and those who are attempting one for their first time and in for a surprise! Being around a friendly and fun environment is one of the things that has kept me around the races. 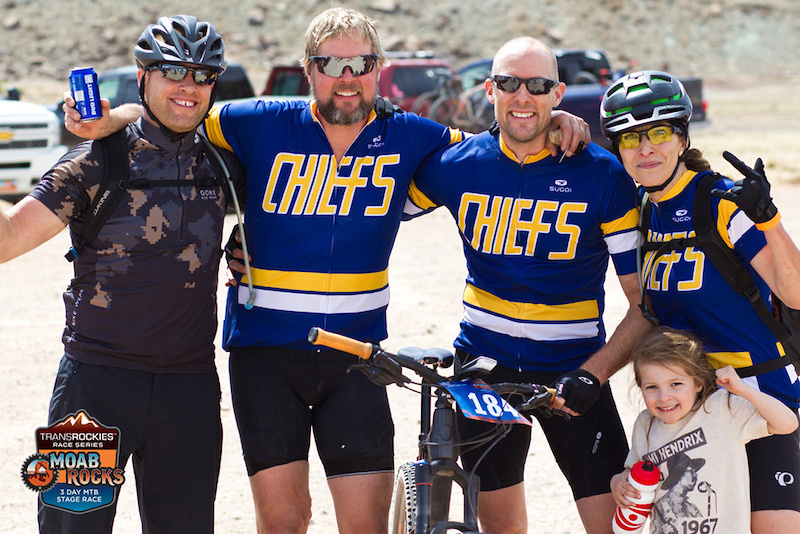 After experiencing 15 years of bike racing you gain some insight to what races offer, and a stage race like this offers me everything I needed at this time of year while trying to build the racing shape through hard hours, multiple days, challenging terrain, a relaxing and fun atmosphere, and friends to socialize with. Stage 3 required a lot of attention to follow where the trail went. In the 50+ men's category, it was Guy Sutton who swept the three days and won the overall. Sutton was closely followed by his teammate Greg Twitty in second. Caroline Colonna won the first two stages in the women's 40+ and kept things in check for the final stage to take the overall win ahead of Wendy Lyall. Daniel Mahlum swept all three stages in the men's 40+ while the battle for second and third was tight between Pascal Bonaventure and Dax Massey. 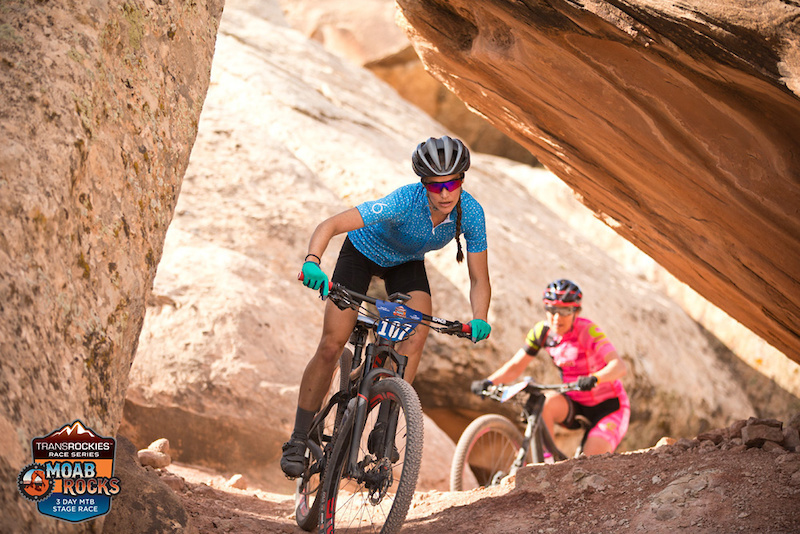 The open women's category had a fight for second and third overall. Though the winning spot was taken by Sparky Moir Sears who took significant time on day 1 that propelled her to the overall. A hard-charging Jennifer Smith, who won the final two stages but couldn't make up enough time on Sears, finished second overall as Marlee Dixon took the final podium spot in third. 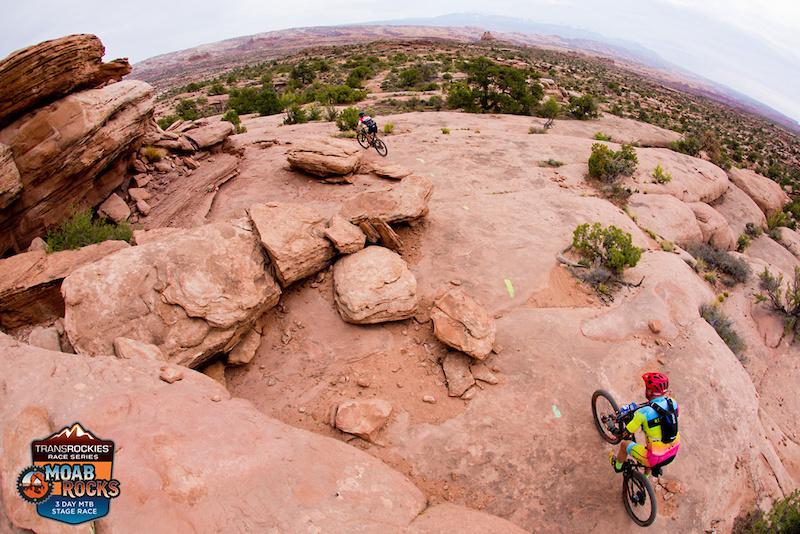 Stage 2 on Klondike Bluffs - Sears navigates through one of Moab's many rock features. 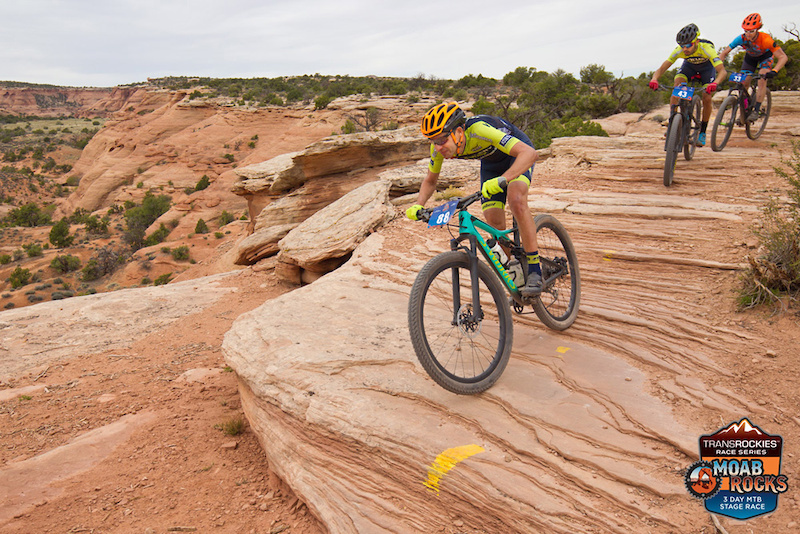 2017 Moab Rocks open men's winner, Geoff Kabush, once again was able to snag the overall after a tight battle with Payson McElveen. By tight battle, I mean a little over 3 seconds after 5 hours and 26 minutes. Kabush won the first two stages and had less than 10 seconds going into the final stage but McElveen laid down the gauntlet today with multiple attacks and was able to get away in the final 3 minutes but couldn't quite gain those few extra seconds needed for the overall. 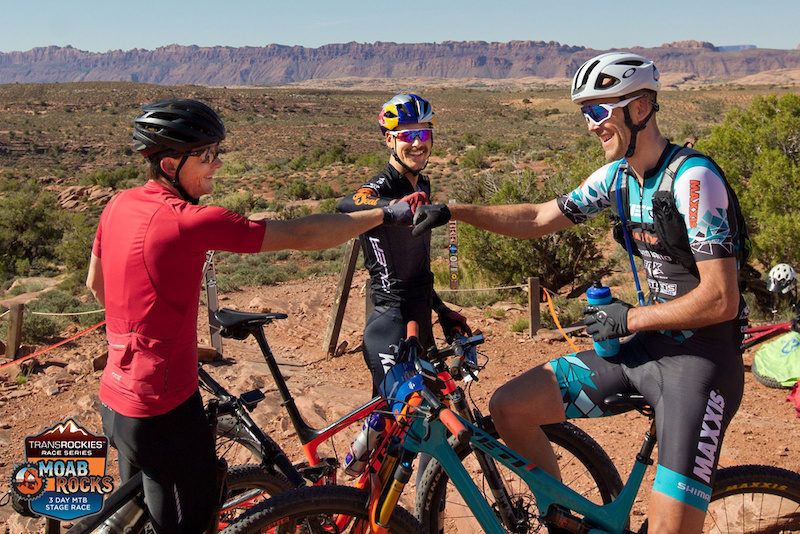 Cheers to all the volunteers, event staff, and the City of Moab for a great weekend of playing bikes! At the end of the day we all love riding bikes. Don't take yourself too seriously because you might miss out on the fun times. That was an awesome race! Stoked that my wife could take the win! Also stoked to be headed for some loam after three days of eating dust and sand and running into sandstone curbs over and over and over again. Loam sounds tasty at the moment! 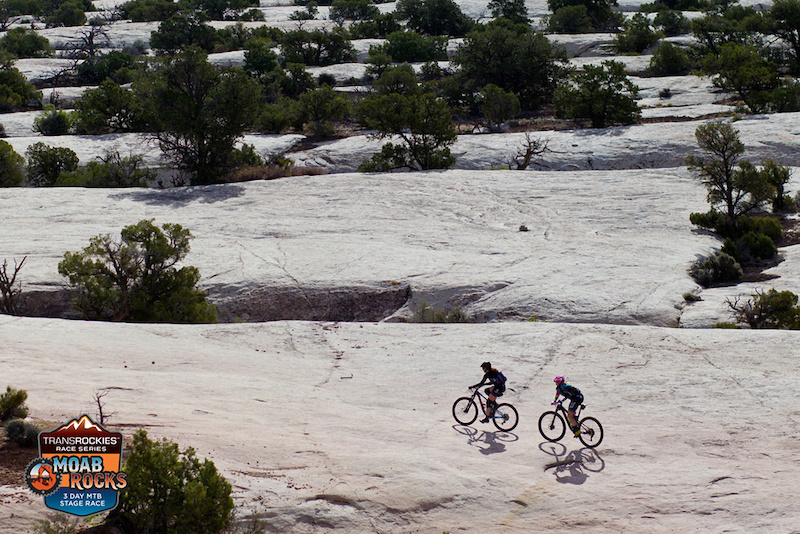 "...and running into sandstone curbs over and over and over again." As a local, that was funny. Thanks. Looks like some sick down-country! 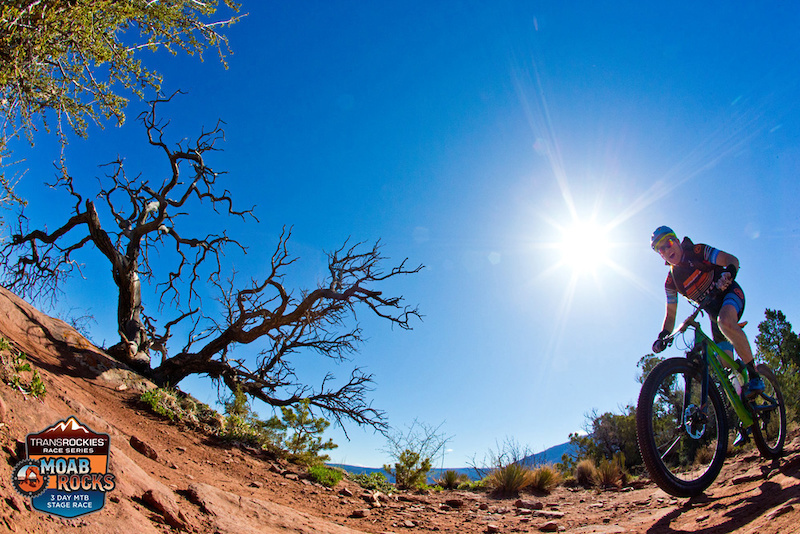 Love Moab! That's a lot of spandex! Your mom's a lot of spandex! "At the end of the day we all love riding bikes. Don't take yourself too seriously because you might miss out on the fun times." Ha, that's me and Mellisa Mertz on the cover photo on day 2!